When I say nachos what do you think of? Tortilla chips, right? Probably some ground beef or shredded chicken on top? Finished off with cheese, salsa, and maybe some refried beans? Sounds about right, doesn’t it? 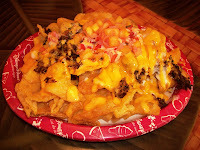 What if I told you there was another version of nachos at Walt Disney World that will shake up your perception of nachos and is like having a fiesta in your mouth? 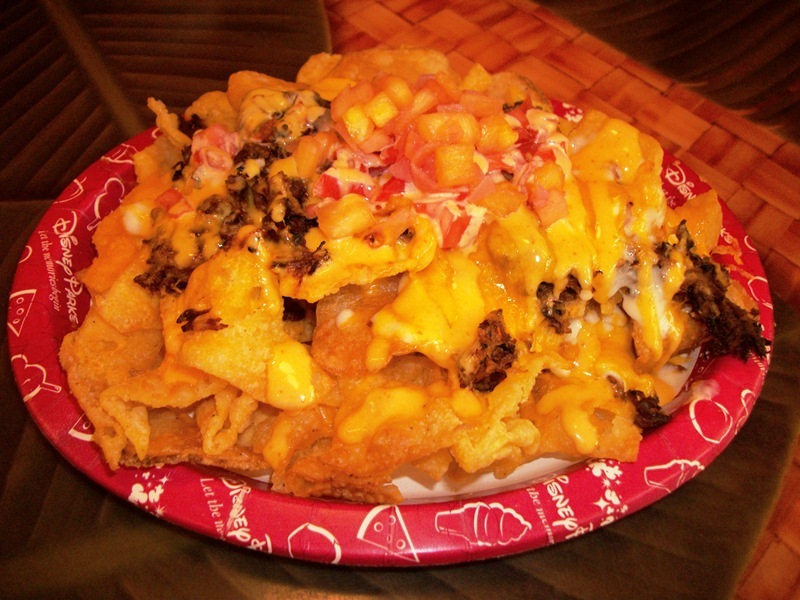 To find these nachos, you have to head over to Capt. Cook’s at the Polynesian Resort. The ubiquitous cheese is still here, it two varieties, but that is where the similarities end with these Pork Nachos. The salsa, while including tomatoes, brings a bit of heat with the sweet, by adding in mangos to bring bright flavors to the dish. The main thrust of these nachos, however, comes from the savory, fall-apart pork that is applied in ample amounts. For those wondering, this is the same pulled pork that Capt. Cook’s uses for the Aloha Pork Sandwich. The last, but perhaps most intriguing element of the Pork Nachos, are the chips that make up the base. They are a combination of the housemade potato chips and friend wantons, giving the same crunch as tortillas, but your taste buds will be shocked by the different flavors. The serving size of the Pork Nachos is, in a word, huge! This dish could definitely serve as a side dish for 2 to 4, depending upon the appetite size and main courses of the diners. And while you could eat this as a meal by yourself, and you had better be very hungry if you plan to take this mountain of nachos on, you are going to want to share this unique take on nachos with the rest of your party, so plan accordingly. The Pork Nachos is one of those dishes I stumbled into, but that I cannot wait to dig into again! Whether you’re hanging out at the Polynesian, resort hopping around the Seven Seas Lagoon, or thinking of leaving the Magic Kingdom to switch your lunch options up, you cannot go wrong with Capt. Cook’s Pork Nachos! And for dessert- a self-serve Dole Whip! Sounds like a perfect meal.